What are the Different Types of Permanent Adhesive? 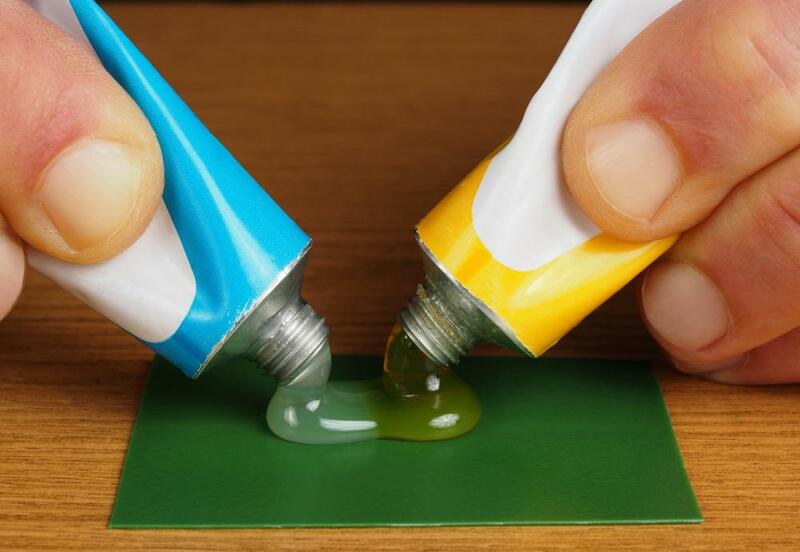 Epoxy consists of two separate tubes which are mixed together to make an adhesive. Cyanoacrylate, also called super glue, is a common permanent adhesive. PVC glue is solvent-based, melting the two pieces of pipe together permanently. An adhesive is a product or substance that is designed to bond two surfaces together, and a permanent adhesive is made to have the strongest possible bond once it has set. There are many different kinds of permanent adhesives, some of which are better at bonding different types of surfaces together than others. They also can differ in the way that they are prepared and used, and some are stronger than others. The first type of strong permanent adhesive someone may think of is a type of super glue, which is less commonly referred to as cyanoacrylate. This type of glue is particularly powerful for bonding together non-porous surfaces as well as skin, so it must be used carefully. Another of its characteristics is that it is water resistant, and different kinds of cyanoacrylates are popularly used by model-builders and other hobbyists for building many different things, such as models, and other arts and crafts. A common type of permanent adhesive that is used mostly in home repair is epoxy, which actually consists of two components, both of which are liquid. One is a resin and the other is a hardener, and when these are combined in equal parts they create a permanent bond, sometimes with the aid of additional chemicals or light. What sets epoxy apart from other types of permanent adhesive is that when it cures it holds its form. Epoxy can also be sanded or cut with tools once it has cured, and is also popularly used electronics, marine repair, and more. Permanent adhesive tape is among the easiest types of powerful glues to utilize. It is exactly what it sounds like – a roll of tape that is made to place between two objects that are to be bonded together. The tape is placed in a dispenser that is made to easily roll the tape onto one of the surfaces prior to bonding, and the long distance of tape that can be dispensed at a time makes it useful for many industrial applications. Small rolls of permanent adhesive tape can be made from materials that are acid free and safe for mounting photos or other objects for the hobby of scrapbooking. Plastic adhesives are another kind of permanent adhesives that can be useful for connecting plastic, acrylic, and other types of surfaces that may be smooth, difficult or even impossible with other kinds of glue. These can be applied with a brush, sprayed on, or squeezed from a tube onto the surface that is to be treated, and can create one of the strongest bonds of any kind of glue. This makes plastic adhesives one of the most common type of glues, and they can be used for a limitless array of applications. How Do I Choose the Best Plastic Adhesive? How Do I Choose the Best Model Glue? How Do I Choose the Best Polymer Adhesive? What Are the Different Types of Epoxy Dispenser? What are the Different Types of Epoxy Adhesive? What are the Different Types of Acrylic Adhesive? I really need help. What can I use to permanently bond name tags to somewhat cotton bags?